Turf & Dirt - On Horse Racing: "Dialed In - Disconnected"... Derby Top 21 for March 7th. "Dialed In - Disconnected"... Derby Top 21 for March 7th. Wow! What was up with DIALED IN? Okay, it was his first 2-turn, mile and an eighth race, and against older rivals. But, Dialed In just couldn't get past the Equestrio, who took a hard right at the wire, drifting out 6 paths. And, Dialed In was getting 7 pounds from the winner, who happened to be his stablemate. This is our #2 horse on the Kentucky Derby Trail? I don't think so. Equestrio beats stablemate Dialed In. Photo: Joe Ganley/EquiSport Photos 1/1250th @ f/4, iso 1250, 200mm. I'm still trying to figure out what Dialed In got out of this race. He rated last of 5 horses off of a pedestrian pace, got a ton of dirt kicked in his face, and just failed to fire when asked. Trainer Nick Zito was obviously searching for positives, "The horse that beat him isn't a bad horse. It was two turns too; they were older horses; and there was no speed in the race." Zito continued, "I would have liked to win, but I have to be happy. It was a mile and an eighth over the track. He made the mile and an eighth." Okay great Nick... he finished the race. Yet another Derby contender just dropped a few spots. Julien Leparoux seems intent on seeing the Mineshaft colt through to the Derby. 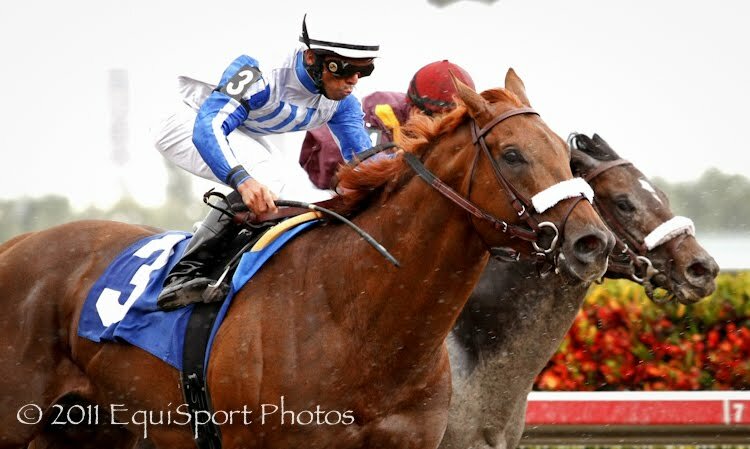 "We got a trip, a good teaching trip, but there was no pace unfortunately," Leparoux said. "It's horse racing -- he's going to have horses next to him in the Derby, so he's got to learn that. Hello Julien.... there were 5 horses in this race. You have horses next to you during training hours. STAY THIRSTY seems to be the only horse staying on form over the past couple of months, and prevailed in the Gotham Stakes (G3) Saturday. I wouldn't call it a brilliant win, but the Bernardini colt has to move up the Derby Trail a few notches, if only because others are moving backwards. After breaking poorly, Ramon Dominguez guided Stay Thirsty in mid pack through easy fractions, before taking charge coming out of the turn. "I was very happy with him. He gave me whatever I asked him, and he galloped out very strong, too." Owner Mike Repole now has 2 of the Top 5 ranked colts including Stay Thirsty's stablemate, Uncle Mo, as the #1 ranked horse. Never at a loss for words, Repole is happy for Stay Thirsty to have some time in the spotlight. "I couldn't be any happier for this horse, because I keep hearing about 'Mo's shadow' and 'stablemate' and this is one of the top six three-year-olds in the country," he said after the race. 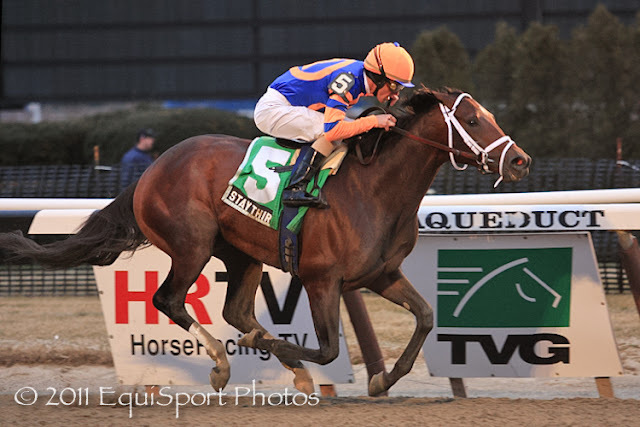 "Today is all about Stay Thirsty and I think he proved that when you get away from Boys At Tosconova and you get away from Uncle Mo, this is a pretty special horse. MY COMMENTS... since you stopped by. This 2 or 3 race training method of getting fresh horses to the Derby is NOT working for most. Everybody seems to be going backwards. Way too much emphasis is being placed on pedigree, 2YO stats, dosage, Beyer figs, hair style..... whatev! Give me a break. Those who base a Derby contender list based on history and statistics are missing one key ingredient... experience. Horses with little to no 3YO experience are getting knocked off like flies. If you're going to get in the gate with 19 other strapping young 3 year olds, you better have some battle field experience. Two races at 3 ain't enough experience. To me, it seems that horses are moving DOWN the list his year, rather than anyone making a move up. No one is racing against strong fields. Last weeks' "also ran" sort of inherits a better spot in the Top 20, as this weeks' "golden boy" gets dusted. Dialed in is a perfect example of a horse backing up. He was #2 on a lot of lists until now. Zito ran him today to dodge Uncle Mo, and lost in an Allowance Optional Claimer! Who has he beaten so far? Oh yeah... Sweet Ducky. So now, he moves down the list, and a few "also rans" go past him. The same could be said for Uncle Mo and Jaycito? They haven't run since last November, but they stay in the Top 5 because other horses get bumped. Jaycito finished 7th in the BC 4 months ago.. and he's 5th in the rankings? Really? To Honor And Serve dropped to #8 after getting beat by an Allowance winner, Soldat. This light training regimen (and losing) gives a little more credibility to a horse like Gourmet Dinner, for at least being battle tested. He had more than enough earnings from winning the flukish Delta Jackpot last year. But, to his credit, he has not dodged the competition, running 3rd in the Holy Bull and 2nd in the Fountain of Youth. Give me a Gourmet Dinner any day over a Dialed In. All that said, we have yet to see a break out performance like a Quality Road or an I Want Revenge. Maybe by April 3rd we'll finally see a horse race, in the Florida Derby.